Top 100 Films by Genre Type: The Guinness Book of Film, subtitled The Ultimate Guide to the Best Films Ever, was an essential hard-cover movie guide published in 1999. It reviewed the top 1000 movies of the 20th Century. 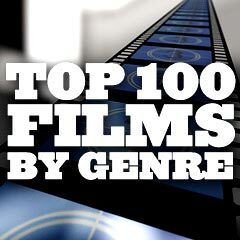 See also Filmsite's Top 100 Films by Genre Type. "the movies that have given the most pleasure to the most people"
From the 1000 films, the guide also selected a Top 100 Films, "essential recommendations" categorized into a Top 5 for each of twenty different genres (action, biopic, animated, comedy, cult, disaster, drama, fantasy, gangster, horror, musical, period, romance, science-fiction, silent, spy, swashbuckler, thriller, war, western), each represented below by icons. The links from the genre categories are to Filmsite's essays on Film Genres.